If mobile has contributed a unique art form to the culture, it's the selfie. The ubiquitous smartphone camera-snapped self-portraits have become as synonymous with mobile phones as apps and text messaging. So why not turn them into a new kind of native advertising for mobile? That's the thinking behind the new Selfie ad format from Opera Mediaworks and Celtra that allows users to insert photos of themselves in display ads, which they can then share with friends via Facebook and Twitter. The unit includes features like layered drawings, filters and picture-in-picture effects that advertisers can choose from. Lufthansa, for example, is using the new unit as part of its “Nonstop you” campaign this fall focusing on customer service and leisure travel. It allows users to literally “picture themselves” at various travel destinations using their smartphones and send out the Lufthansa-branded selfies via social media. A demo of the airline's ad features copy inviting users to take a selfie in Italy, France or Germany, leaving a cut-out for the photo in front of an appropriate landmark like the Eiffel Tower. It's something like a selfie-meets-Photoshop. And kind of cheesy, as that combination of tools suggests. But the larger question is why anyone would create a Selfie ad instead of just sending a selfie from wherever they are or posting it on Facebook. Opera Mediaworks and Celtra also teamed up on another mobile ad format called Gyro, designed to showcase a product with a 3D panoramic view “allowing consumers to truly immerse themselves into the interior of a car, a hotel room or the seating in a theatre, to name just a few,” according to the companies' description. Gyro can be used with various ad types including banners, expandable units or full-screen and uses the built-in gyroscope and accelerometer to detect and simulate a user's movements. 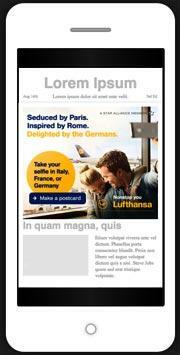 The ads are also optimized for different smartphones and tablets. This is more in the tradition of mobile rich media ads that use features like a phone's accelerometer to try to create a more immersive experience particular to mobile. So one format allows users to look at themselves, and the other, to look broadly outward. Mediaworks and Celtra are obviously hoping advertisers' mobile budgets include both, but the panoramic ad is likely to have more utility for brands than trying to capitalize on a mobile habit that is already a form of personal advertising. Does Facebook Need Another Messaging App?